When the term SUV was coined back in the late 80s to describe the Ford Explorer and its imitators, the word “sports” in the descriptor ‘sports utility vehicle’ referred to the amount of sports gear your utility vehicle could transport. It certainly didn’t mean that your SUV was sporting to drive. 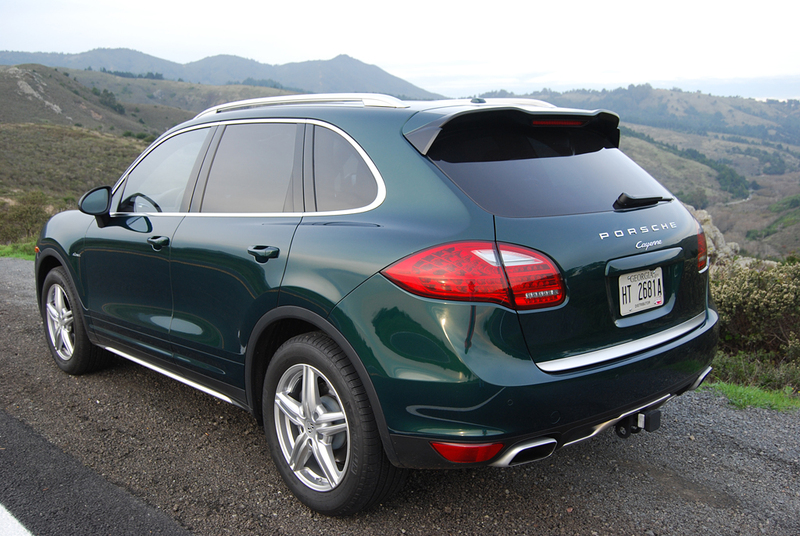 But all that changed when BMW debuted the X5, followed by Porsche’s introduction of the Cayenne. These SUVs put a premium on driving enjoyment rather than pack mule capacity. Porsche has been refining the Cayenne for almost a decade now, and the latest diesel-powered offering is a testament to just how much they’ve improved the breed. This is a heavy duty truck, with a towing capacity of 7,700 pounds. It’s also capable of traversing just about any wilderness trail, thanks to full time all wheel drive, air-adjustable ride height, and locking front and center differentials. Yet on paved roads, the Cayenne diesel behaves much like any Porsche sports car, with an agility and responsiveness that belie its curb weight of 4,700 pounds. Under the hood lies a 3.0 liter, turbocharged, V-6 diesel that makes just 240hp. While that horsepower rating seems low compared to available gasoline fueled Cayennes — which range from 300hp (3.6 liter V-6) to 500hp (4.8 liter twin turbo V-8) — the diesel’s immediate torque output of 406 lb.-ft. elevates it above the rest of the model line for sheer grunt. When you swing wide to pass slower traffic, the diesel’s torque produces an instant surge that is unmatched by any other Cayenne. It’s exactly the kind of thrust you’re going to need when towing a travel trailer over the Sierras. 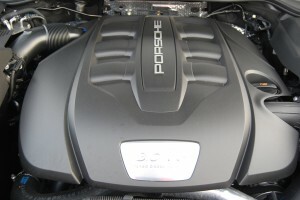 The beauty of the Cayenne diesel is that Porsche cloaks this hammer of an engine in such a silken shroud that you never know when it’s working hard. All the oomph takes place between 2,000 and 4,000 rpm. Almost no noise intrudes on full acceleration, and there is never a whiff of diesel fuel inside the plush cabin. Mileage figures are excellent, with 29 MPG on tap for freeway trips. Given this Cayenne’s 26.4 gallon tank you can expect to run 700 miles between fills. The silky 8-speed gearbox insures that the diesel always remains in the heart of its narrow operating range. Of course, you can manually override the Tiptronic S transmission by engaging gear of choice via metal thumb selectors on the steering wheel. But there’s really no need to do so as the diesel does not benefit from high rpm operation. Our test Cayenne seemed to be fitted with just about every extra Porsche could conjure from the long list of special order items. Topping the extravagances was the $5,165 “Natural interior in Espresso” which looked terrific and covered every single door panel and dashboard facet with rich, dark brown, hand stitched leather. If you want the effective air suspension, it will set you back another $3,980. 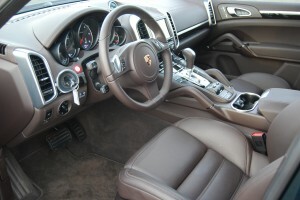 When we gave our local Porsche salesman a look at this car’s sticker price of $91,990, he suggested that you could do a lot better by incorporating some of its stand alone options into cheaper available packages. 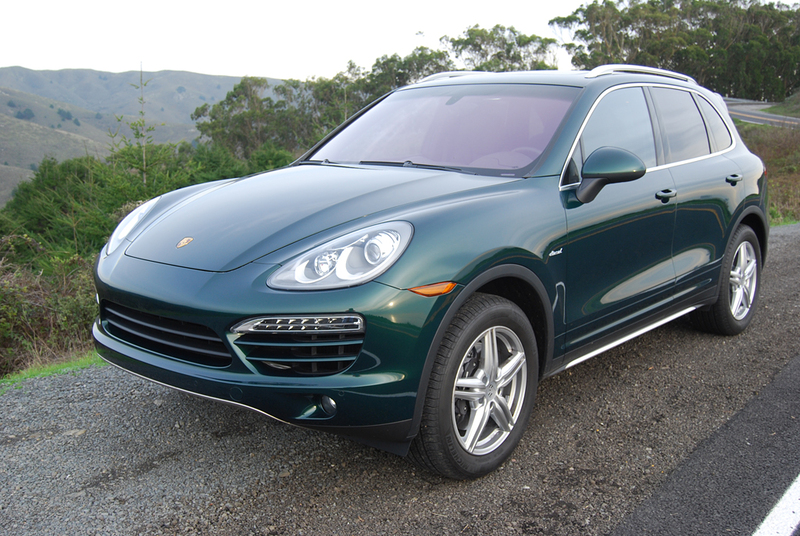 The fact of the matter is, the base price of this diesel Cayenne stands at just $55,750. This compares to $48,850 for the gas V-6, $69,850 for the Hybrid model, and $82,050 for the V-8 powered 400hp GTS. So you’ll have to do a good bit of driving before you recover the initially higher investment the diesel demands over the gas V-6. But if you plan on towing a significant load, if you loathe engine noise, or if you just want to be different from the herd, then opt for the most effective Cayenne of them all, the new turbo diesel.